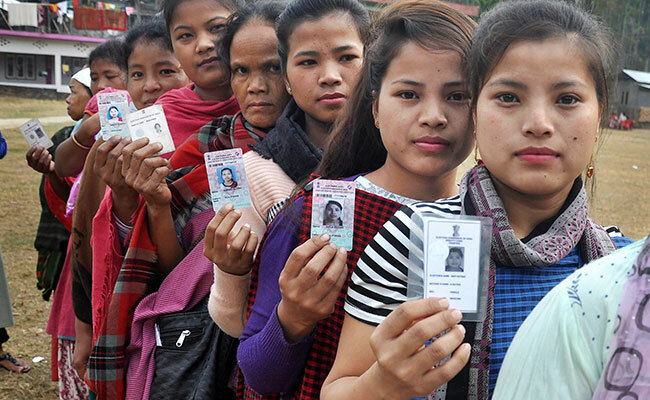 File image of women voters in Meghalaya. When it comes to women, the northeastern region can boast of treating women better than most other parts of the country. Not only women are visible in public spaces in these states on their own terms, but they are also accorded a better social standing and a bigger role in economic activities. Even in the political sphere, all the states see a massive participation of women voters and a plausible active engagement of women activists at grassroots level. However as one move upwards in the political ladder, women become scant and it is true for all the states of the region. In fact the gap between number of women in social sphere and political decision making centres is so stark that one is left wondering about the extent of women empowerment in the region. A look at the poor representation of women in the state assemblies is a proof of the fact that politics continues to be a man’s turf in the region. Let us take a look at the states separately. Assam’s history bears witness to women like Mula Gabharu, Kanaklata, Chandraprabha Saikiani etc. But the present picture is grim. While women work actively at the grassroots they are seldom encouraged to enter the political fray. No party gives enough tickets to women candidates harping on lack of winnability. Women in Assam comprise 48.82% of the population but there is only one woman MP in Rajya Sabha and two in Lok Sabha. In Assembly there are only 14 MLAs out of a total of 126. In 2016 Assembly elections, women were only 8.6% of the total candidates. In fact they were only 91 in number, even lesser than 2011. Out of the 91 candidates only 14 won the polls. Women are given tickets in constituencies where the chances of winning is already thin. Women are also given tickets as last option. And no party lags behind in this blatant gender discrimination. In the first part of 2018, elections were held in Tripura, Nagaland and Meghalaya. All the states witnessed very high voter turnout. While Tripura and Meghalaya each elected only three women MLAs, Nagaland failed to send even a single woman MLA to Assembly. Women candidates were also very few in number. In Tripura out of 297 candidates only 23 were women. And in Nagaland, out of 196 only five were women candidates. While in Arunachal Pradesh, voting to Assembly started in 1978, women are yet to make their mark. Despite their immense contribution to the socio-economic aspect of the state, women are not represented adequately. In the first elections, three women were nominated. While women comfortably cross the 33% reservation mark at Panchayat levels, their number in Assembly is very less. Even women’s issues do not find adequate space in election agenda. In the last Assembly elections in 2014 only two women managed to win in a total of 60 seat house. Manipur has made a mark in history because of women led social movements. Two nupi lans were led by women, the organization Meira Paibis have a strong social presence. They staged the naked protest against the murder of Thangjam Manorama by Assam Rifles personnel. However the political scenario will dismay us. For 60 seats only 10 women candidates contested in a total of 266 candidates. And only two women could win. A shocker of this 2017 election was that Irom Sharmila who undertook 16-year-long hunger strike against Armed Forces’ Special Powers Act (AFSPA) failed to cross even 100 votes. While Irom was the Iron Lady of Manipur and enjoyed extensive support, her political acceptability was poor. Parties often cite winnability as a big question. However in Manipur violence and insurgency is also cited as causes for keeping women away from electoral politics. In Mizoram, the number of women MLAs is nil. While in 2018, 16 women contested none could win. Mizo National Front (MNF), the party which came to power after ten long years, did not give a single ticket to women candidates. Their justification remains that women are not strong enough to win. In 2014, Congress’s Vanlalawmpuii Chawngthu was given a ticket to contest in a bye-elections. After winning she was made a Minister. Mizoram had a woman minister after a gap of 27 years! The scenario across states is similar. While many northeastern states like Meghalaya boast of matrilineal communities, it remains a fact that empowerment of women continues to be superficial. Politics is essentially still a man’s affair. Across the country, the representation is as low as 7.6% with Haryana topping with 14.4%. In the Northeast, most women candidates fight as independents showing the utmost disdain of the mainstream political parties. Here even the role of left parties in Tripura is questionable. While the state does well in some other parameters of human development, child marriage continues to be high in Tripura. Interestingly every time a woman candidate wins, the victory margin is often very high. As such question of winnability is not the right reason behind their poor participation. There is an inbuilt patriarchal bias in political parties which are yet to break away from age old concept of public/private divide. Leaving aside mainstream assembly elections, women are kept out of traditional councils in most of these states. Tribal bodies in Nagaland led by Naga Hoho which has no women, opposed staunchly the 33% reservation for women on the excuse that it goes against Naga customary laws. With such meager representation of women, Muslim women, women from smaller tribes, Adivasi women are the doubly marginalized sections. A society which claims to stand up for gender equality cannot keep the political arena out of women’s reach. If women are kept outside decision making bodies, then gender equality in the region will continue to be superficial and limited to the exotic and not translate to the improvement of the material conditions of women across the board.